Who doesn’t want a nice home, really? One that is worthy of social media channels, one that you look forward to coming home to, and one that will make you want to stay in for a long, long time. To turn your house into that dream home, it certainly matters what you put inside it. Beautiful furniture for a beautiful home — that’s definitely on the agenda for Etch & Bolts, an online furniture store in Singapore that creates beautifully crafted furniture that you can customise. Etch & Bolts “aim[s] to marry art and furniture, to bring everyday living to a higher level” without the crazy price tag. They’ve gotten quite a following online with their range of minimal and unique furniture; all their furniture have names, which makes for a nice way to start a bond with the inanimate objects in your house. There is a certain minimalist aesthetic to the furniture they offer — no fancy details or garish colours are used — which is great. 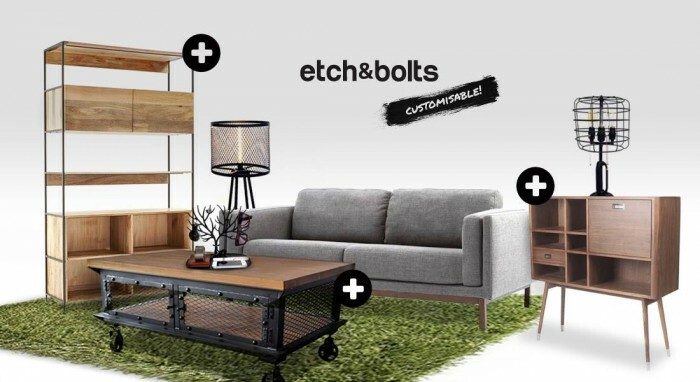 From the use of wood and metal, to Scandinavian-esque prints on cushions, Etch & Bolts conveys a modern, updated, yet homely vibe with its furniture line. It’s classy without being too cold, and fun without looking too kiddy. Nobody wants to buy that sofa everyone has, or have the same minimalist three-legged coffee table in ‘distressed timber’, so it’s only understandable why people are flocking to the world of customised furniture — which is something that Etch & Bolts offers. To cope with the tight living spaces, irregular layouts and narrow walking spaces that houses are designed in these days, Etch & Bolts gives users the opportunity to tweak and make adjustments to their existing models to fit to their homes. Fancy a two-seater instead of a three-seater, or a different fabric for the armchair? They’re open to catering to your preferences. Benches, tables, and shelves are also included in the list of furniture that can be customised. All the customisation can be done online via their website itself, where you’ll be given a few options to choose from in terms of material and colour. 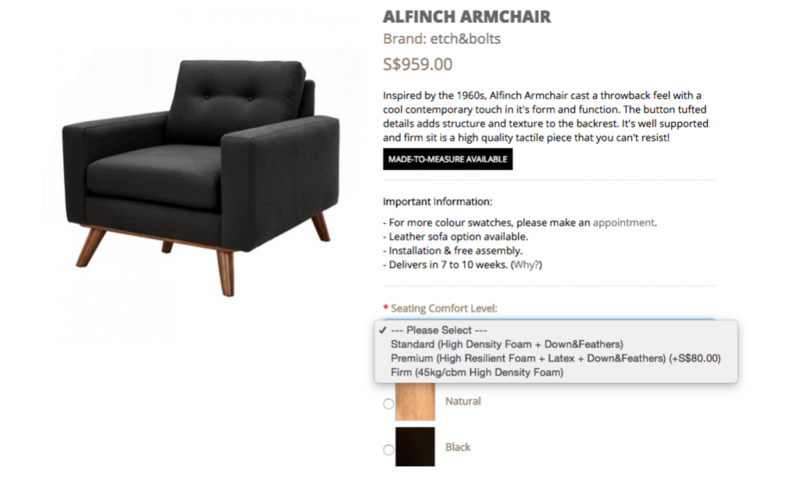 Just a few clicks and you’re on your way to your dream sofa/chair/table! Beyond furniture, Etch & Bolts also stocks everything else a home might need, such as art pieces and soy scented candles. Fancy. If popping by a physical store is not something you see yourself doing, then just shop away from the comfort of your home. Etch & Bolts even has a blog that complements your shopping experience, giving you home decor ideas as you browse their site. This means you can learn tips and tricks to designing your house, and get some style ideas for your living spaces. If Scandinavian-inspired furniture does not cut it for you, there’s a side of local on Etch & Bolts too. They house a variety of local-themed products on their online store, like a collection of throw pillows with nostalgic notebook covers, and locally-designed quirky chairs and lamps. Those who still prefer the traditional way of browsing furniture, though, will be glad to know that Etch & Bolts has opened a new physical store at UB. One, #01-05, where you can check out the quality and feel of their products for yourself. 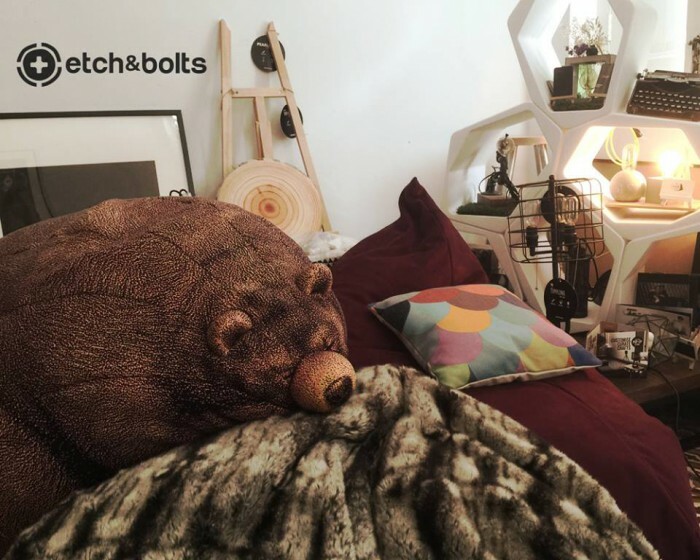 If anything, Etch & Bolts truly understands the science of small spaces. 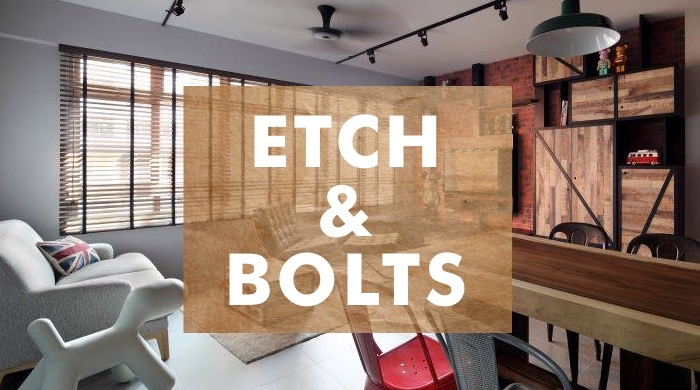 From utilising tiny areas, to brightening up generic ones, Etch & Bolts could make your little HDB flat something you look forward to going to at the end of each day.